Thanks for the Answers Rob! After I wrote the questions, I was looking at the webstore, and saw the breakdown of the Formoraic with the cursed herd, and Far Thule, and the others. I think I enjoy the 'Far Thule' group the most, but they are all pretty awesome! I love the white hair on the Gorgons as well. I have a bunch of Atlanteans I started last year. I should try to at least finish them up before starting anything new. I always love seeing more painted fomor fuzzies. Great work! Looks amazing! And great 'in progress' shots as well. I love the concept for the figure, it works well with the whole darklands aesthetic. In the Fomoraic muster, the Walvax unit is listed as only being 'Baalor' for Realm, where as the Tain is Both Baalor & Conad. The Kraaken is listed as Conad only where as (IIRC) they were for both realms prior, similar to the Dainoch. Both Armies look great! Trees vs Undead, a classic rivalry. This is really going to command people's attention at Salute! Excellent work! WOW! That looks amazing! Great work. Topic: Kretos Ogros base size? Re: Kretos Ogros base size? Skull king wrote: I hope this means an even BIGGER kolossus is in the works who'll utilize the 120mm base! How about a two month challenge, starting in Feb/March? Since there's a lot of stuff that will ship then, we can hopefully get more folks on board, plus, that's a good amount of preparation time for people to build and undercoat stuff. I think Zed's point system from the last one was good. I think this is the first time I've seen a painted Great Hart! Loving all the consistent color between your wolf beasties, it's great! I like that you did the Boney ridge a different color than the skin, I don't think I've ever seen any infernii like that, it looks cool! Topic: Formoraic 2k Battle host. updated for new musters! Re: Formoraic 2k Battle host. updated for new musters! Topic: New Ubiquity Rules- Not Happy! Re: New Ubiquity Rules- Not Happy! greyknight wrote: Those are real nice. What model range are they from? They're from the 'Blood Rage' CMON board game which came out last year. Re: Formoraic 2k Battle host. Do the individuals special rules still apply, even if they cannot be a commander? For instance, would a Tain of Baalor still make all warriors of Baalor units mainstay, despite them not being able to be mustered under them? @Sorn - This thread is so AMAZING! In the year since the site went down, do you have anything more to show us? This is all looking amazing JerzyK! Just curious, what other Ysians (or any other Mierce minis) do you have coming for us in the future? I'm digging the colors you've chosen for Domnech! And the Dragotaur (sorry, I forget what it's proper darklands name is) looks great! Ok, Naara and her big pet Feleox are finished! I'm going to try and finish some other Fomoraic figures in the next week or so, and then I'll try to post another big army shot in the first comment. Alright, my unit of Gabrax with their Shaman warchief is finished! 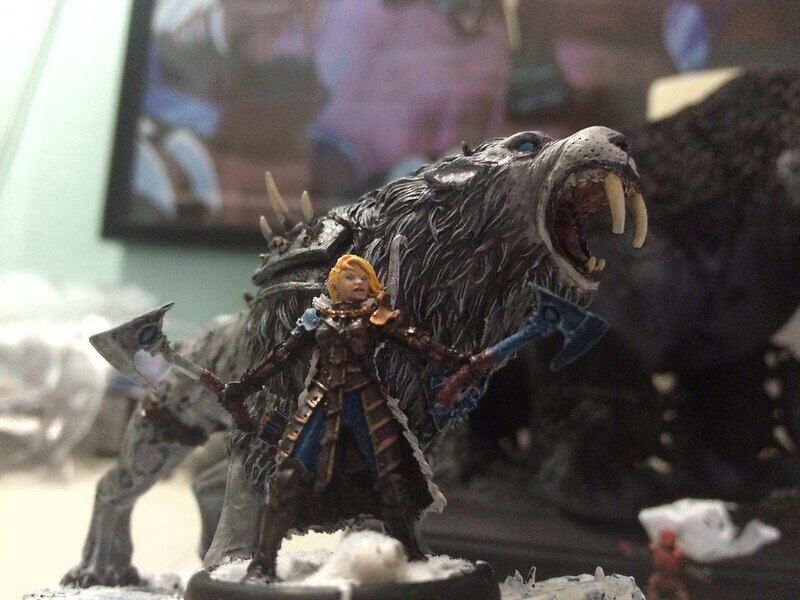 Next up is Naara & her giant kitty! @Jerzyk - Brugg looks amazing! You've exposed details on that model that I didn't even know were there! @Crushmore - I like the bases so far, glad you're getting a good amount of kroks going. 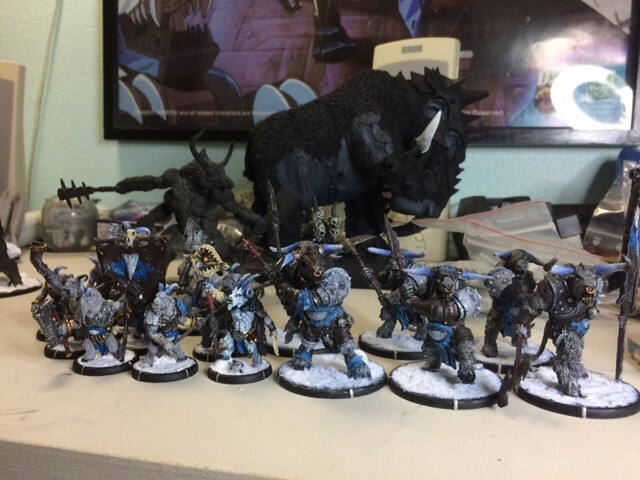 Anxious to see a full painted unit of them. Loving all the green! I especially like how the regular trolls are green, and the mountain troll is blue. I plan to distinguish mine similarly. I think they will contrast particularly well with my Albainn & Erainn, who will have more warm earthy tones. Formoraic 2k Battle host. updated for new musters! Topic: Monthly painting challenge - any interest? 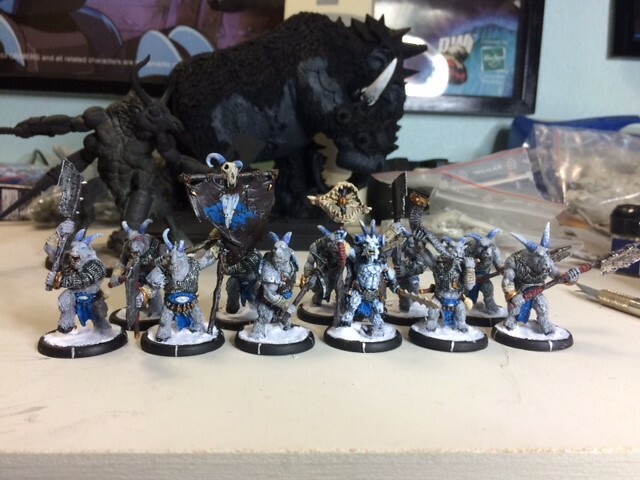 Re: Monthly painting challenge - any interest?